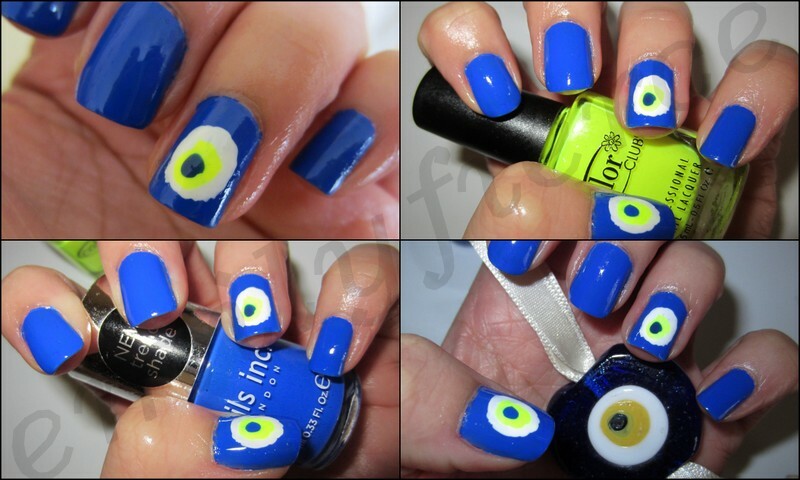 Today I want to share with you my Evil Eye manicure. I used to do, this manicure a lot when I was a teenager. I love evil eye beads as accessories and decoration for home. I also love the color combination of blue and white, it reminds me of summer and Greek islands. For this manicure I used Nails Inc Baker Street as a base and for the blue dot, Color Club French Tip for the white dot and Color Club Yell-Oh for the yellow dot. These are my top 10 nail colors for summer 2012. Bold colors and neons are very popular this spring and summer and we can easily rock these colors on both nails and toenails. So enjoy the color explosion!! !